Here is a huge very heavy 20 foot log chain with 6 inch hooks on each end. Each link measures 2.5 long. Asking $75. o.b.o. Text if interested. 20 log chains with hooks at both ends.$35.00 each.Suitable for semi or farm use.Pick up in coffeyville kansas. I have a 14 inch log chain. It is 20 ft. It has no repair links. Good condition. You can call 438-0144 or email no text please. 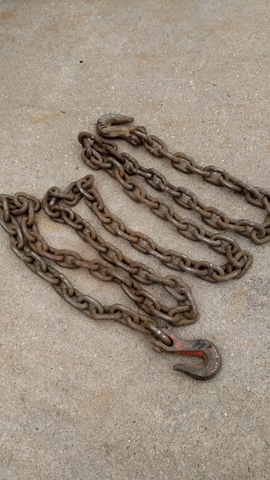 Have a Very Heavy 11' Log Chain selling for $35.00.